I have an unusual background with skills in a number of areas. I am an avid innovator with 106 issued US patents (and counting) and over 125 Issued patents world-wide. My 100th US Patent issued issued on June 23, 2015. I have a passion for STEM and have coached Robotics and Science Olympiad along with my wife at Cardinal Gibbons High School for the past 10 years. I worked closely with the school to establish a MakerSpace which is also utilized as part of their engineering program. 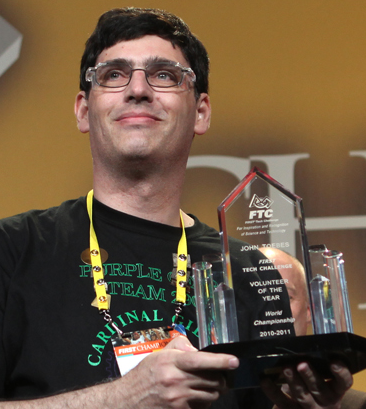 I am greatly appreciative of FIRST for recognizing the hard work of our team in developing the Samantha module and awarding me the 2011 FTC Volunteer of the year. We are very proud of the team we coach - Team 2901 - The Purple Gears - from Cardinal Gibbons High School - for winning the Inspire Award at the North Carolina FIRST Tech Challenge 2011 Aggieland Championship and making it to the World Championship in St. Louis. Along the way, the kids also managed to submit a US Patent for their Folding Forklift design which has issued. And yes for those of you who are asking, that is indeed chain mail made out of aluminum pop-tabs. My wife and I did all the code and support for the Samantha Module providing 802.11 support for a Lego Mindstorms NXT which was used for five years as the robot control system for the FIRST Tech Challenge program. 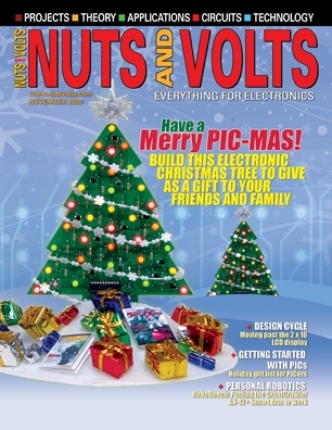 Our Picmas Tree was featured on the front cover of the November 2008 issue of Nuts and Volts Magazine.